Copyright American Physiological Society 2011. Acute elevation of circulating lipids, such as the postprandial state, contributes to increased cardiovascular risk. 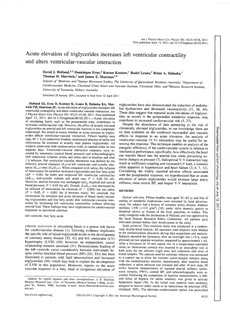 However, the effect of acutely elevated triglycerides on arterial and left ventricular function is not completely understood. We aimed to assess whether an acute increase in triglycerides affects ventricular-vascular interaction. Fifteen healthy men (age, 49 ± 8 yr) underwent blinded, randomized infusion of saline and intravenous fat emulsion to acutely raise plasma triglycerides. All subjects underwent both randomization trials, in random order on two separate days. Ventricular-vascular interaction measures were recorded by tonometry (central blood pressure) and echocardiography (left ventricular volumes, strain, and strain rate) at baseline and after 1 h infusion. Net ventricular-vascular interaction was defined by the effective arterial elastance (EA)-to-left ventricular end-systolic elastance (ELV) ratio (EA/ELV). When compared with saline, the infusion of intravenous fat emulsion increased triglycerides and free fatty acids (ΔP < 0.001 for both) and improved left ventricular contractility (ΔELV, end-systolic volume and strain rate; P < 0.05 for all). However, arterial function was unchanged (ΔEA, brachial and central blood pressure; P > 0.05 for all). Overall, EA/ELV was decreased by an infusion of intravenous fat emulsion (P = 0.004) but not saline (P > 0.05, P = 0.001 for Δ between trials). We conclude that intravenous fat emulsion and acute elevation of blood lipids (including triglycerides and free fatty acids) alter ventricular-vascular interaction by increasing left ventricular contractility without affecting arterial load. These findings may have implications for cardiovascular responses to parenteral nutrition.